In June 2017, Charlena Evans became a Diamond State CLT home owner in Ingram Village. Congratulations to the first three families to become home owners and Diamond State CLT members in Sussex County! Dominic Mancuso and David Marsh recently made settlement on our first DSCLT home in Sussex County! Robert and Carol Van Sciver became the second Diamond State CLT Homeowners in Sussex County shortly thereafter. 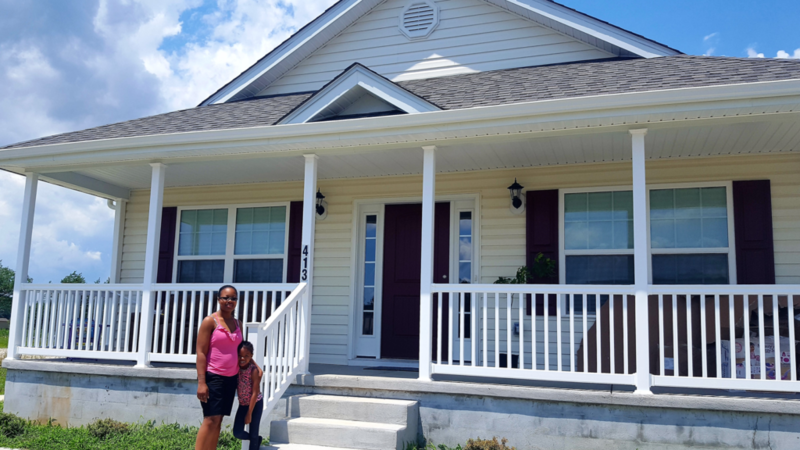 And Charlena Evans purchased the third home built by Diamond State CLT in Sussex County at Ingram Village. It is the fulfillment of a long process for Diamond State CLT to have begun to create permanently affordable homes in Sussex County. Kent County Commissioner Eric Buckson was instrumental in bringing the NSP program to Kent County. The Housing Development Fund (HDF) of the Delaware State Housing Authority (DSHA) provided additional monies to assist DSCLT homebuyers purchasing homes in Rodney Village. So far DSCLT has acquired nine homes and rehabilitated six, making them permanently affordable. We are working toward completing at least ten homes in the community. HDF funding will help make the remaining Rodney Village homes affordable to low-income first-time homebuyers. The work in Rodney Village has been made possible by Kent County Levy Court which works closely with DSCLT to reinvest program income from the Neighborhood Stabilization Program (NSP) in Rodney Village. Additional funds were provided by the Longwood Foundation, Discover Bank, NCALL Loan Fund, Deutsche Bank, the Delaware Community Foundation, and the Laffey-McHugh Foundation. Applicants like this diverse, engaged community, which is close to parks, within walking distance of retail, and is in a good school district. Most of our home buyers find their monthly mortgage payments to be lower than what they were previously paying in rent. Go here to start on the path to home ownership, leave us a message, ask for more information, or sign up for our updates. We will schedule a home buyer orientation with you at which you can find out how to qualify for home ownership at Diamond State CLT. We are a nonprofit, membership-based, community-governed organization offering perpetually affordable home ownership opportunities using the community land trust model. becoming a CLT home owner. Here is a 90-second video explaining the CLT. You can support our work by becoming a member of the Diamond State Community Land Trust.